Endocrinology is the branch of medicine and biol ogy dealing with the regulation of body functions by hormones and other biochemicals, and the treatment of endocrine system imbalances. It is a complex area of the life sciences that calls on the many disciplines that are present in the Bio Alps cluster. The global market for endocrinology drugs is divided into market segments including: diabetes, growth-hormone, acromegaly and hypogonadism. All of these are growing markets with exciting developments in new molecules, drug formulation and drug delivery systems. The world market for diabetes medications will reach $55.3bn in 20171, the growth hormone mar ket alone is estimated to reach US$ 11.2 billion worldwide by 20182 while the infertility market will reach US$ 1.5 billion by 20173. Novartis and Sanofi are among the companies within the BioAlps cluster which have developed specific products to manage diabetes. The World Health Organization (WHO), based in Geneva, estimates that diabetes will be the 7th leading cause of death in 2030, with developing coun tries taking on a much greater share of the bur den of disease. Type 1 diabetes is caused by the body’s inability to make insulin, required to regu late glucose content. Type 2 diabetes results from the body’s ineffective use of insulin. People with diabetes require regular monitoring and ongoing treatment to maintain blood sugar levels, creating demand for the development of new micro- and medical technologies, software and drugs to man age the condition better. The universities and research institutions in the BioAlps have centers of expertise in metabolism, endocrinology and diabetology, spanning basic and applied research, diagnostics and clinical practice. The National Center of Competence in Research (NCCR) “TransCure – From Transport Physiology to Identification of Therapeutic Targets” with the leading house at the University of Bern, seeks to integrate the disciplines of physi ology, structural biology and chemistry to understand how malfunctions in transport proteins and ion channels may contribute to the occurrence of diseases like diabetes, osteoporosis and neurodegeneration. THE UNIVERSITY HOSPITALS IN GENEVA, LAUSANNE AND BERN ARE AMONG THE FIRST IN THE WORLD TO DEVELOP PATIENT-CENTERED APPROACHES TO THE TREATMENT OF DIABETES, WHETHER FOR OLDER OR YOUNGER PATIENTS. The BioAlps region is highly innovative, with com petencies across the field of endocrinology and metabolism. Indeed, the first ever recombinant hormone registered, Gonal-F® to treat infertil ity, was developed in the region by Merck Serono who subsequently developed other leading re combinant treatments for infertility. The region hosts another market leader in infertility, Ferring, as well as several start-ups such as PregLem, ac quired by Gedeon Richter, and ObsEva, also spe cialised in women’s reproductive health. Ernest Loumaye co-founded ObsEva in 2012 with industry veteran André Chollet. ObsEva is a specialty biopharmaceutical company dedicated to the development of innovative drugs for women’s reproductive medicine. 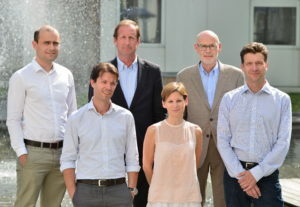 Nine months after ObsEva was founded, the company signed a licensing deal from Merck Serono to develop compounds for pre-term labor and concurrently closed a CHF 32 million Series-A financing round (€ 25.6 million). The Series A financing round was led by Sofinnova Partners, and co-led by Sofinnova Ventures and Novo A/S. Based conveniently in the center of a start-up campus, within easy range of larger companies and research institutions, ObsEva has benefitted from the close proximity in the region of the many experts in drug development, R&D, clinical medicine and finance to prosper at a fast rate. The wealth of knowledge and expertise in the small geographic BioAlps region lie in the research institutions, teaching and research hospitals, and companies, who all collaborate and compete in an environment highly conducive to creating products and opening new market opportunities. Mushroom cultivation for diabetes prevention. Hormones for obstetrics, fertility, gynecology and growth deficiency.